YOU’LL BE SPOILED FOR CHOICE! Italian cookery offers many variations throughout the country. Some features are well rooted in every part of the country, like the importance of olive oil, wine, cheese, and the usage of high-quality fresh ingredients. Each region has a particular local cuisine depending on its history, its background and the characteristics of its territory. At Flavours, after many years of experience offering culinary vacations in various Italian regions, we have a good knowledge of the local cuisines in Sicily, Puglia, Umbria, Tuscany and Bologna. Read on for a brief overview of the differences in Italian cookery across its regions. SICILY, the island in the very South of Italy – Before becoming part of the Italian Republic, Sicily was under the occupation of foreign powers for 3000 years and how could each new invasion not add another layer to this incredibly rich cuisine? In the delicious Sicilian cuisine Greek and Spanish influences go hand in hand both with the delicacies inherited from the French cuisine (titled families had French cooks) and Arab sweets. 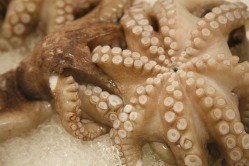 Each area of Sicily has different culinary features, mainly depending on the availability of the ingredients. The recipes are unique, distinctive and part of a cookery tradition that has remained unvaried for centuries. In general, fish and seafood recipes are found along the coastline while in the hinterland meat, legumes and cheese are more common. Citrus fruits are also vital to the Sicilian cuisine. Two of the most famous Sicilian dishes are Caponata, a tasty eggplant stew, and Arancini, delicious fried rice balls. BOLOGNA, an important artistic centre in Northern Italy – Bologna, the capital city of Emilia Romagna, is renowned for its culinary tradition. The well-known meat-based Bolognese sauce, or ragù alla Bolognese, is the best sauce for the most famous types of pasta that originated in this area: tagliatelle, long flat ribbon-shaped pasta, tortellini, stuffed ring-shaped pasta, and lasagne, the widely-known dish made of interleaving layers of pasta with layers of Bolognese sauce, béchamel and Parmesan cheese (another one of the many famous products of the region). The production of cured pork meats like prosciutto,mortadella and salame is very important and the use of Balsamic vinegar is very common in the whole region of Emilia Romagna. UMBRIA, the green heart of Italy – The cuisine of Umbria, the exact centre of Italy and the only peninsular region without access to the sea, could not be anything else but famous for its rich production of meats: the quality of the local cured meats, prosciutto and salameis distinctive and pork dishes, like the well-known and tasty porchetta (suckling pig), are very common. The region is famous also for the rich game overall of wild boars and pheasant which are often used to prepare delicious pâté for crostini and sauces forpappardelle and pici, traditional homemade pasta. The Umbrian cuisine is rooted in Etruscan and Roman habits and it is also famous for its lentils, beans, wine, cheese and high-quality olive oil production. 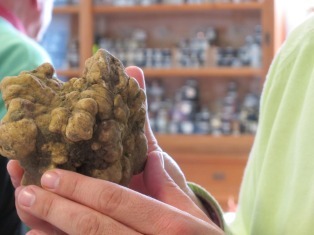 Truffles are one of the most renowned local products, which is why they are always included in the best first and second course Umbrian dishes. PUGLIA, the heel of the Italy’s boot – Puglia is the largest producer of olive oil in Italy. The cuisine, simple and fresh, uses extensively seafood and fish (especially mussels and oysters) that are abundantly offered by the marvellous seas of Puglia, the Ionian and the Adriatic Seas. Savoury fresh mussels and oysters are often the base of some of the tastiest dishes of Puglia. 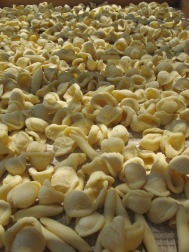 A traditional dish is the famous orecchiette, a distinctive little ear-shaped Puglian type of homemade pasta which is usually eaten with cime di rapa, fresh turnip tops, or with rocket and cherry tomatoes. Cheese is also very well known thanks to two famous types: the tear drop shaped caciocavallo cheese and the heavenly burrata, a solid mozzarella shell that contains both mozzarella and cream inside giving it the softest texture ever. The shell shaping is made through air blowing and traditionally people used to do it by mouth. TUSCANY – A typical feature of Tuscan cuisine is the simplicity of the recipes, all tasty and genuine. Ingredients are fresh and come from the vegetable gardens (legumes, vegetables) or from the woods (mushrooms, fresh fruit) and tasty meats from local breeding farms: it is enough to think about the famous Florentine steak, high-quality beef from the Chiana Valley and from Maremma. 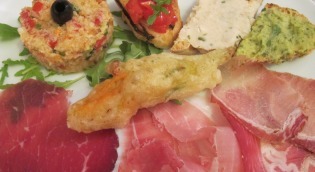 Local cured meats and game meats are also very common and appreciated all around Italy. 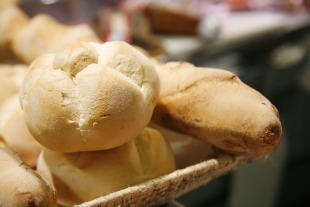 Bread is also central in Tuscan cuisine: Tuscan bread is very peculiar and unique because it is made without salt. For Tuscan people bread is very important, and they don’t like to throw it away, even when it is getting stale. 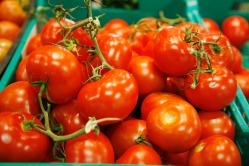 In fact, lots of traditional recipes include bread and original ways to reuse it, among the most famous are Panzanella, Ribollita and Pappa al pomodoro. Pecorino cheese is also very well-known. All these regions have very diverse traditional cuisines which are almost impossible to summarize in few lines… which is why culinary travel is the best way to discover and experience them all in person! As you can see it won’t be easy to choose your destination… you are spoiled for choice! This is a featured article by Flavours Holidays, a specialist tour operator offering quality cooking, painting and pilates vacations with -no single supplements for solo travelers- in Italy since 1998. I love regional cuisine in Italy and that’s one of the best things about living here – changing region and changing everything on your plate and in your wineglass! The importance of seasonal vegetables is evident everywhere and something that I think everyone enjoys. I was recently in Basilicata and the food was wonderful!